Very cool survey done by Ancestry.com! Using AncestryDNA results from over a quarter million people, the AncestryDNA science team set out to perform a “genetic census” of the United States: a survey of the U.S. using only DNA. Where did the ancestors of today’s Americans come from? Do Americans in the Midwest hail from similar places of the world as in the Northeast, or as in the South? If you follow the link you can select each one of the 26 regions used by AncestryDNA and see the average score for each state. Interesting to compare with my own findings sofar which were of course based on a way smaller sample size . Then again Aframs in this survey aren't separated from people with other ethnic backgrounds and they only considered birth place and not deep rooted ancestry from 1 single state/area. I made some screenshots to see where each African category had its highest score. All things being the same you would expect this to be the state with the highest % of Aframs. Which would be Mississippi. This is however NOT the case for Mali, Senegal and SE Bantu. Despite having a lower % of Aframs than Mississippi South Carolina still scores more for it. 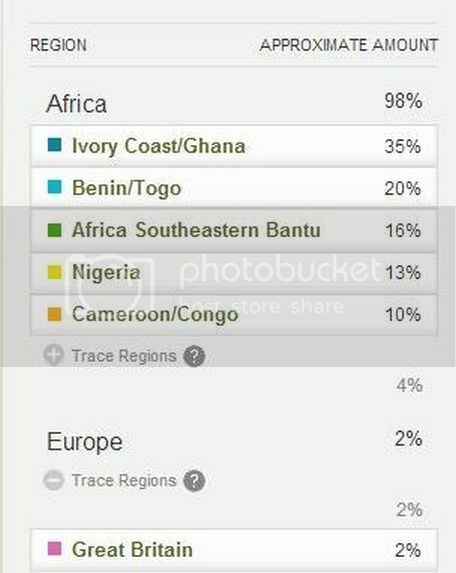 So i suppose this confirms that the Carolina's have higher than average Senegambian ancestry and also Congolese/Angolan (which was already known from historical references). For the other categories it was indeed as expected Mississippi with the highest %'s. 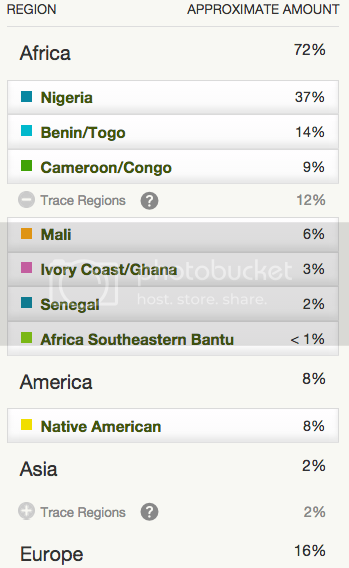 Interestingly Cameroon-Congo had a higher average than Nigeria, unlike my findings sofar. However if you look at Virginia they have higher Nigeria than Cameroon-Congo. Confirming the strong Igbo presence? Last edited by Don Felipe; 04-18-2014 at 11:06 AM. SSA part is being labeled SE Bantu, again because of lack of more fitting categories. Also interesting that West Asian > North African. Before they did their update it used to be the opposite on 23andme for Horners if i'm not mistaken. Thank you for sharing this, its interesting to note that Cape Verdeans, Dominicans and Puerto Ricans share a higher concentration of North African admixtures than African Americans and other people who may have had Slave ancestry. Perhaps the higher percentage of North African admixture results from the Moorish presence in Spain. 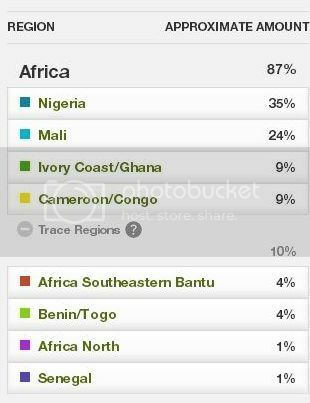 I don't expect the averages to change drastically anymore to be honest, this seems to be pretty much the average regional breakdown for AA's nation wide according to AncestryDNA and solely focussed on their African side. But the averages are hiding much underlying variation so it's still interesting to have a look at the outliers, which are shown in "maximum" and "ranked #1"
When it comes to exceptionally high scores for just one category it's usually Nigeria, Cameroon/Congo or Ghana/Ivory Coast. 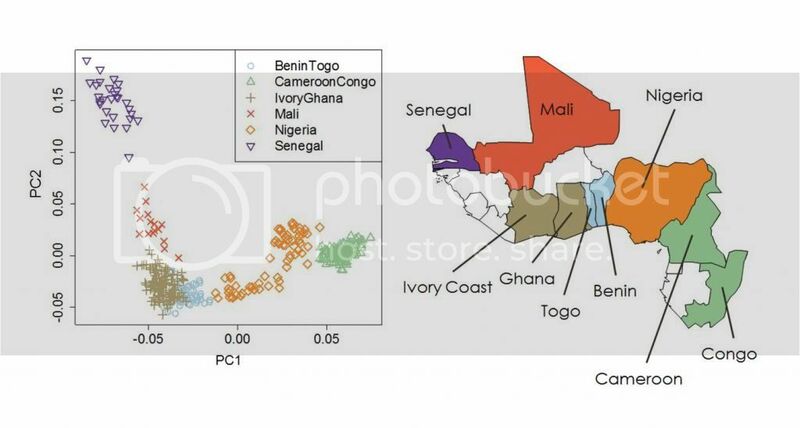 I was a bit surprised about the small number of Senegal & Mali outliers, but perhaps if they had been combined into 1 "Upper Guinean" category there would have been more. As i already mentioned earlier many of the higher Senegal or Mali scores seem to occur for people with deep USA roots in South Carolina. Here's a cool map by Ancestry which confirms that finding. Posting some individual results that seem to be outliers, keep in mind most results will be more balanced and in line with the averages. First 2 persons indeed from the Carolina's. Senegal rarely pops up at #1 or even the top 3 for the AA results i've seen sofar, only 2 other persons i've seen had Senegal at nr.1. His Mali is also quite high btw. this one's prolly half Afram, from Pensylvania, but who knows perhaps going back some generations also with Carolina roots. At number 2 but higher % than first one. Nigeria gets the most #1 spots and also the highest outliers. This one still showing high Mali in addition. Last edited by Don Felipe; 08-09-2014 at 03:07 PM. Two atypical AA results, from what i've seen sofar very unusual but still part of AA variety. This guy has the craziest results i've seen for an Afram up till now . In fact i'm not sure if he's Afram all the way although he considers himself "black", he's also on 23andme so i suppose his CoA results might provide some solid clues about any possible foreign ancestry from several generations ago beyond family recollection. His maternal haplo is M32c! Which is mostly seen among Malagassy if i'm not mistaken, quite rare but i've seen it reported for several other Aframs. The North African is more mysterious and there could be several scenario's i suppose. The North African category on Ancestry seems to be more solidly "Berber" / "Maghrebi" than on 23andme from what i've seen from the Egyptian and Somalian results posted earlier. I suspect his Euro breakdown, which looks atypical for an AA who will be mostly if not exclusively NW European, will be related to some of those scenarios. 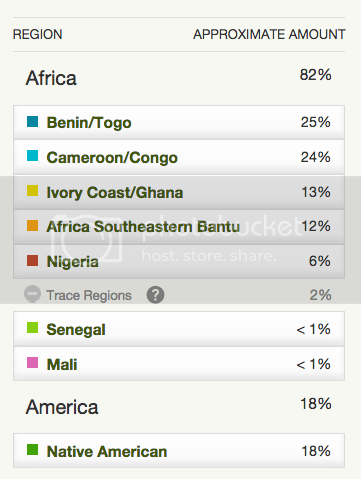 His minimal Senegal & Mali make it seem less likely that it's derived from a Fula ancestor, but who knows. Having one exotic lineage from Madagascar, Sahellian West Africa or even North Africa from many, many generations ago is always a possibility of course but it tends to be VERY much dilluted from what i've seen showing up in minimal %'s, often near the margins of error. Really the thing that amazes me with this guy is just the random combination of it all (remember he also shows above average Amerindian for an Afram) and particularly the ELEVATED level of his North African. I mean having 13% North African is pretty much unique for a New Worlder unless they have recent ancestry from those parts, dating from the POST-colonial era. Second atypical result for an Afram, not so much the SSA breakdown but the whopping 28% Amerindian! First time ever i'm seeing an Afram scoring more Amerindian than Euro, also on 23andme, almost zamboish This person actually has a fullblooded Native American grandmother from Utah so that accounts for 25%. In addition there's probably also some minor (3-5%) older Amerindian ancestry via her Afram grandparents. Even though for most Aframs their Native American %'s have been rather subdued contradicting family stories about significant Amerindian ancestry in the last 3 or 4 generations, this case shows it's not always like that. Again, here are the statistics: Whereas virtually all African Americans have a considerable amount of European ancestry in their genomes, only 19 percent have at least 1 percent Native American ancestry, and only 5 percent of African American people carry more than 2 percent Native American ancestry. Last edited by Don Felipe; 09-13-2014 at 12:25 PM. A few Anglo-Caribbean results compared with other Afro-mixed groups. Of course only the AA sample size is big enough to be considered representative in any way, but you can already see some patterns that will be sustained i think even when i'll get more results in for the other nationalities. Anglo-Caribbean has 7 Jamaicans, 3 Belizeans, 3 Guyanese, 1 Trini, 1 from Montserrat and 1 mixed West Indian (several islands), Franco Caribbean is only 2 Haitians but might still be pretty representative. Hispanic Caribbeans is mostly PR's right now and a few Dominicans, things will look different if i get results for persons with higher SSA. Same goes for South Americans, which is mostly Colombians right now. North African is distorting things a bit for persons with lower SSA. If it wasn't included in total African you'd see even more pronounced Upper Guinean (Senegal + Mali) and SE Bantu in the SSA breakdown for Hispanics. Additionally also Nigerians (even Igbo's!) might have carried over some ancient "Benin/Togo" component (originating within Nigeria but nowadays seen more frequently among people from Benin/Togo) into AA's, Jamaicans & other Anglo-Caribbeans. I've seen an Igbo result i will post in a separate thread who scores 17% "Benin/Togo"! Senegal & SE Bantu is lowest among Anglo-Caribbeans for many even at very minimal or non-inexistent level. But for Latin Americans its among the biggest components corresponding with the earliest arrivals of Africans from Upper Guinea and Angola in the Americas in the 1500's/1600's. Given the low SSA of my samples i'm pretty sure things might be different when i get 50%+ SSA Latino results. Cameroon/Congo might partially also be derived from Igbo's or related Southeastern Nigerians for Anglo-Caribbeans and AA's. This fully Igbo i've seen scores 24% Cameroon/Congo which is about half of his "Nigeria" score. But it's quite telling how the average Cameroon/Congo % stilll is slightly higher for AA's (who according to historical sources would indeed have more Central African ancestry than West Indians) than it is for Anglo-Caribbeans and also how the 2 Haitians score the highest average. Again according to historical slave trade records genuine Congolese ancestry would indeed be among the highest for the Haitians. Last edited by Don Felipe; 09-25-2014 at 12:38 AM. These two being very similar in the ranking of their top 3 but they're not related for all i know. Garifuna, also notice his elevated Amerindian and ZERO Euro %! High Ghana/Iv.Coast for the first one, more than 50% of his total African ancestry. This one having minimal Euro input, such results probably more frequent among Anglo-Caribbeans than for AA's, although both groups can show wideranging levels of admixture and i 've seen several nearly 100% SSA results for AA's as well. Last edited by Don Felipe; 09-24-2014 at 08:26 PM. I've seen many African Americans show up with Pacific Islander. Why is that? I wouldn't say it shows up for many AA's, it's just a few of them i've seen myself (out of over 200 results). Also it's almost always being shown as Trace region and almost always as <1%, making it pretty much a noise level component. The only time i've seen someone who had it above 1% and not as Trace region was the "atypical AA" result i posted earlier who has 2% Melanesian. It might be real for him indeed or else signalling some other type of related ancestry not captured by the present categories. I've seen "Pacific Islander" %'s also for SE Asians and even South Asians. Finally Ghana/Ivory Coast showing up as main region instead of Benin/Togo for two of them. 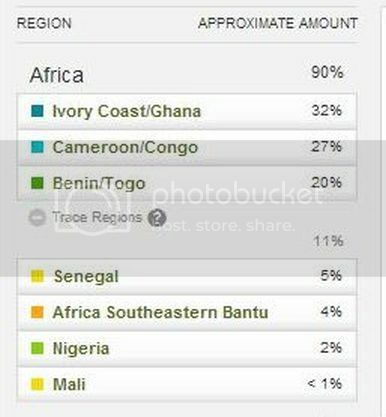 I already came up with several possible reasons why this category sofar seemed to show up so consistently for Jamaicans, i would like to add another (speculative) possibility, that is that aside from Ewe also other non-Akan speaking ethnic groups living in Ghana might be contributing to the ancestral markers being picked up as "Benin/Togo" by AncestryDNA. Again the labelling with country names should NOT be taken too literally! It's all context dependent. Especially the Ga seem to fit the bill as they also live in Togo and are quite numerous (1.8 million according to wiki). The Guang are also interesting as they are supposed to be the oldest inhabitants of Ghana. I suppose this could have made them especially vulnerable to enslavement after they got displaced by more dominant groups like the Akan. 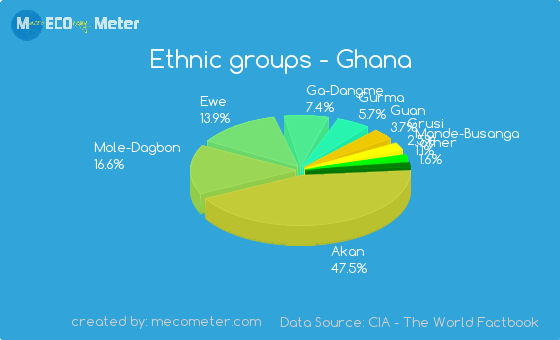 Here's a useful breakdown of ethnic groups in Ghana, of course it might have been different in earlier centuries. Akan constitute almost half of the population, Ewe + Ga combined are about 20%, and there's also several northern groups, i think they were generally named "Champa" in slave records. 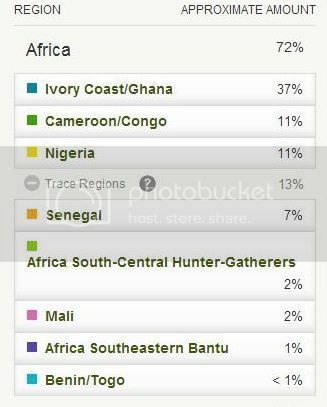 It might very well be that the selftermed "Ghana/IvoryCoast" cluster is only significantly predictive of Akan ancestry and less so for the other ethnic groups, more DNA research and ethnic sampling is needed to be sure though. First Jamaican has very cool results not showing ANY non-African admixture, 100% from the motherland . There must be many like him still in Jamaica otherwise it would be very difficult to maintain such a "pure" lineage. Afterall having offspring with a 90% SSA Jamaican would already get in the way of preserving this 100% score. This one also has a quite high SSA level and again showing Ghana/Ivory Coast as main region, compared with the previous Jamaican results showing Benin/Togo i suppose we could say they might all still be pointing to ancestral connections from Ghana but an Akan ancestor is MUCH more likely for this result, while for the others it might be non-Akan ethnicities from Ghana (aside from other possible scenarios). These two Jamaicans showing Benin/Togo as main region. 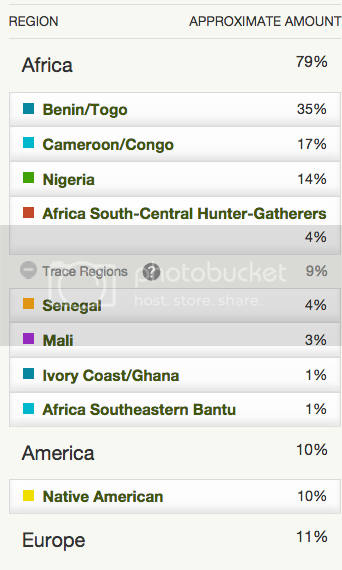 First one VERY convincingly even, it's almost 80% (32/41) of total African ancestry! The second one is actually from Panama but with mostly Jamaican born grandparents. In their African breakdown they follow the Jamaicans quite closely sofar. Focus being on Lower Guinea (Ghana-Nigeria) and also Cameroon/Congo. Senegal being almost absent and Mali & SE Bantu quite low. This was to be expected as most Africans in Belize arrived via Jamaica. The main distinction is more so in the non-SSA admixture, especially the Amerindian scores. Last edited by Don Felipe; 11-23-2014 at 07:38 PM.